Buell Choppers are a favorite amongst the chopper crowd who claims that a Buell motorcycle can be easily transformed into the ultimate "street motorcycle." There are a several major reasons why the Buell motorcycle makes a great chopper but the main three are it's skeletal styling, it's intimidating throaty sound, and ease of maneuverability. Buell prides itself on being one of the first companies to manufacture stripped down looking sports bikes. The company calls the Buell the "naked sports bike" but they are often just simply nicknamed Buell choppers. In essence, Buell's entire style philosophy is based on the idea that it is a shame to cover up raw metal with glossy plastic fairings. Buell's are known for their loud, throaty engines that create the kind of loud putting and rumbling sound (called torque) that is famous for waking the whole neighborhood up -- Check out the Cyclone Chopper to the left there. Even the most banal of Buell motorcycles at least sounds like a very glamorous chopper! Buell's are also very sensitive bikes that are known for their intuitive handling on the road. You can back these bikes into a corner and turn them on a dime. This is because, on a Buell, the engine, exhaust and suspension components that create weight are distributed in the center of the bike. This reduces stress on the bike frame, resulting in better handling for the rider. 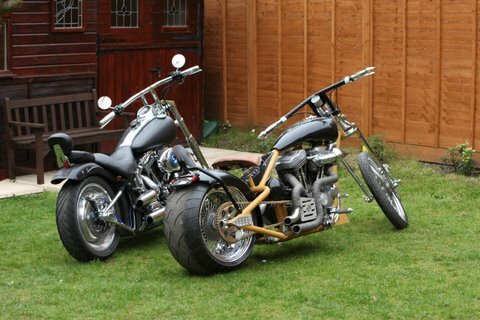 The black Buell chopper pictured above and below was a joint effort between my son Taylor and myself. We made the frame ourselves which took about 3 days of part time work, as opposed to waiting 11 weeks for the last one which he decided to ship in from the USA? Taylor went on an eBay bargain hunt with this build, and sometimes I had to try and reign him in. His taste can be a bit tacky and mish mash at times. He, he. He purchased a second hand buell engine. 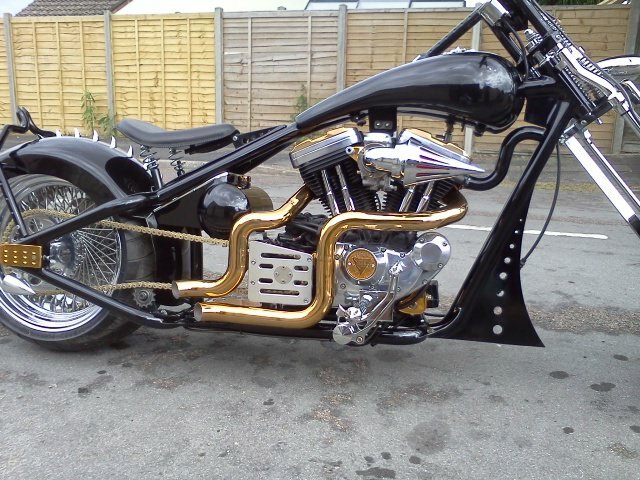 He built the stainless handlebars and sissy bar and exhausts, and a few days before the bike show I surprised him with a very shiny gold pair of exhausts and rocker boxes to give it a bit of bling! We fitted a springer front end (DNA), and we purchased a wide tire sprocket kit from the USA. He wanted a 300 rear tire and had a custom aluminum gas tank made up by a good mate of mine. We decided to enter both my long chopper and his Buell chopper into a local show, just for fun. It was a lot of hassle but it was fun. I remember going inside for the first time (his very first bike show) and he came up to me and said, "Dad, we don't stand a chance. Some of those bikes must have cost £50 K!" I just laughed and said that doesn't mean a thing son, sad to say we didn't win anything, and Taylor sold the chopper before it was completely finished to raise money for his new house build. 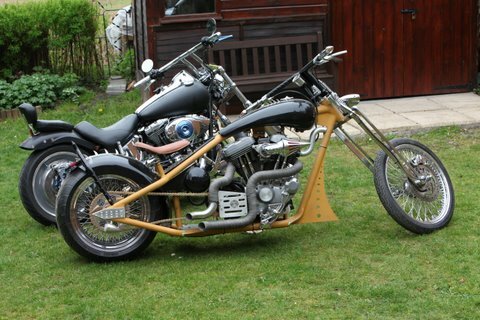 Read about Stinky's current chopper project here. 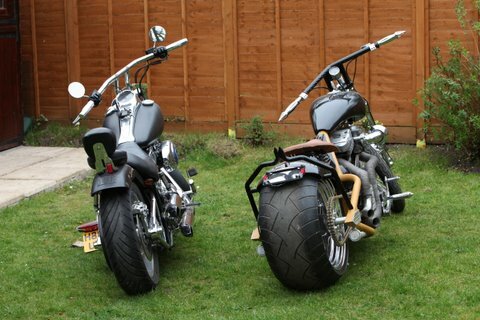 The frames of Buell choppers are also very desirable because they are lightweight and very rigid at the same time. This results in better handling of the machine and better control even if you do outfit it with ape hangers or a fat tire. Buell motorcycles are also designed to minimize the weight of all components not supported by springs or shock absorbers. Lower unsprung weight allows the tires to maintain road contact and traction on irregular surfaces. The single-disc front brake system on all Buell models also reduces the weight of the vehicle and as we all know, the lighter the vehicle, the better the chopper! Although any Buell motorcycle already has the appearance of being very stripped down, the latest trend among chopper enthusiasts is to strip the machine down even more. This gives it a very cool, stark look that pays homage to American Iron. Another popular trend is to strip the Buell right down and then "marry" it with Harley Davidson fixtures and accessories. The effect of this bike is mean, lean and slightly futuristic and of course, because it is a Buell chopper, it makes that satisfying rumbling sound. 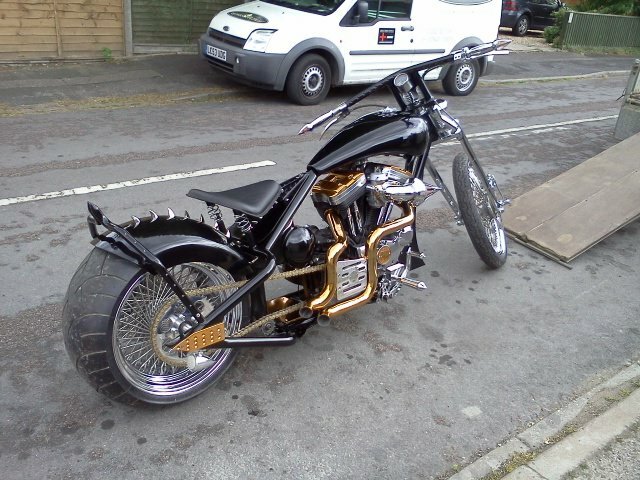 The Buell Bobber Chopper above is really nice, especially since it was home built. The springer front end gives it a really good old school aesthetic on to top of the new school show bike look. A Buell is an inexpensive, sharp-handling machines that gives the American rider something to show off, something to tool with and something to race. Although this bike can't compete with glossy 200 mph Japanese sports bikes, it still handles like one, brakes like one and makes a noise that sounds like you are beating the other competitors into the ground. 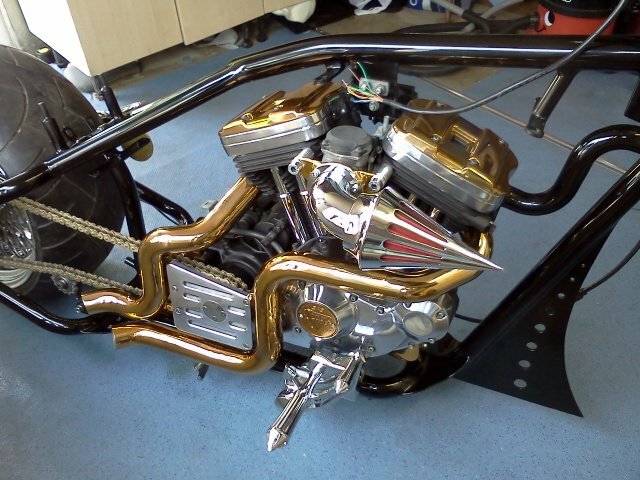 Learn to build Buell choppers starting with this article: Build a chopper.